In 2016 Italy saw 60 superyacht deliveries; Germany boasted a mere two. But what does this really mean? Without any context, it doesn’t mean much – and context is exactly what the country reports, making up some 18 pages of The Superyacht Annual Report: New Build, provide. Data is the future, but data without context is dangerous. My opening statement, for example, would suggest that Italy ranks far beyond Germany with its 30:1 delivery ratio – but suddenly, the context changes, when we learn that the average size of Italy’s 2016 deliveries was 41.4m – a figure that’s dwarfed by Germany’s 114.3m. The two countries are prolific in the new-build sector, but for utterly different reasons – Italy boasts the top two shipyards in the Top 40, due to Benetti and Sanlorenzo’s semi-custom and production business models (the two shipyards delivered 13 and 11 superyachts in 2016 respectively), while Germany, the land of the custom builder, has two of 2016’s most notable deliveries to its name: Abeking & Rasmussen’s 72.5m Cloudbreak, and the largest superyacht on the water by gross tonnage, Lürssen's 156m Dilbar. Though slightly self-indulgent, there is a purpose for placing two vastly different nations in the same above paragraphs. 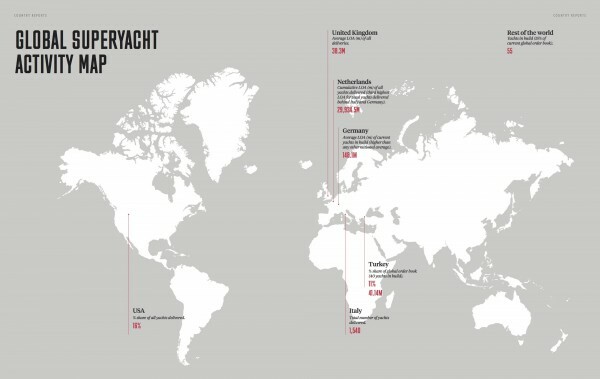 That is, to point out that there’s a reason why the regional analysis in The Superyacht Annual Report: New Build goes into great depth for each region, rather than pitting region A up against region B, something akin to asking whether a captain or chief engineer is better at their job. By detailing the performance of each region, we get closer to the activity of each country and, in doing so, some staggering information is revealed. For example, despite the news media waving a flag for Brexit in the context of UK superyacht builders, both Sunseeker and Princess Yachts (both of whom rank high in the Top 40 Shipyards – Sunseeker at 3 and Princess at 15) have seen a drop in deliveries in 2016. Moreover, of the five most active UK shipyards in the past five years, two (Pendennis and Oyster) did not boast a single delivery in 2016. And while the outcome of the EU referendum cannot be expected to affect shipyard statistics in the months following, the fact that the UK’s leading shipyards’ delivery figures have dropped is significant. The country analysis also makes it clear which yards are dominating any particular region, and thus who is responsible for superyacht build activity. In the UK, for example, the two high-ranking shipyards mentioned above have been responsible for 84 per cent of the region’s deliveries in the past five years. And, interestingly, a similar market share of 82 per cent (though by 14 shipyards) is evident in the other aforementioned country, also known for its production and semi-custom business models – Italy. 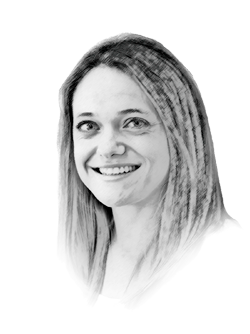 And to close on what some might think an unusual country to conclude with, there is one country that, following Trump’s election, will no doubt create an interesting landscape for the superyacht industry. And, despite lots of commentary on the United States’ suffering build market (it fares very differently in the refit market – keep an eye out for The Superyacht Annual Report: Refit, published Q2 2017 - sign up to receive this report, as well as the New Build report, here), the US’ delivery figures jumped from 2015, with a total of 13 deliveries in 2016. Watch this space. To order your copy of The Superyacht Annual Report: New Build, click here.